Leading Manufacturer of electric drying ovens, batch drying ovens and tray drying oven from Mumbai. We are well known industry in market as the foremost manufacturer, exporter and supplier of Electric Drying Ovens. With the help of our proficient professionals, offered drying ovens are manufactured using high grade components and innovative technology. Used to Cure, Dry, Stove Bake operation, provided drying oven are available in diversified sizes and designs to meet the requirements of our clients. With the support of our experts and sophisticated in-house facilities, we have been able to offer a Batch Drying Ovens. Used for curing of paint films or baking of powder coating components, offered drying ovens are precisely manufactured using optimum quality components and advanced technology under the vigilance of our adroit professionals. The provided drying ovens are checked on different quality measures in order to ensure their flawlessness. Moreover, these drying ovens are available in variegated sizes and designs. Our organization has successfully expanded its business in market owing to the offered elevated quality array of Tray Drying Oven. 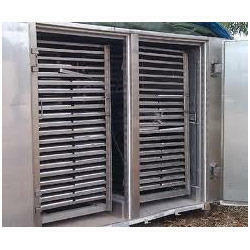 Highly acknowledged in varied industries, our offered drying oven is available in variegated specifications and designs. Provided drying oven is manufactured by our adroit personnel using high grade components and cutting edge technology. Used in the fabrication process of these industrial ovens, customers can avail this drying oven from us at nominal prices.